Happy Groundhog Day! 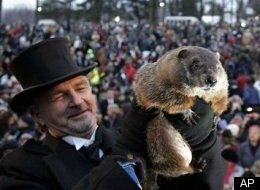 As many of you may already know, today was Groundhog Day and the furry creature Punxsutawney Phil had no mercy on us in regards to this chilling Winter season when he saw his shadow. As the old tradition goes, if the ground hog see his shadow then we are stuck with 6 more weeks of winter weather. However, if he doesn't see his shadow, we are granted an early Spring. With this tradition dating back to the 1800's, this ground hog has definitely kept up with the times as well as technology. Just like everyone else this day in age, Punxsutawney Phil likes to send text messages too. If you are interested in receiving Punxsutawney's weather prediction from today, just text Groundhog to 247365.